CSUN students Amanda Derzy and Amanda Nieto pose for a photo during the 2017 Golden Globe Awards. Photo provided by Amanda Derzy. 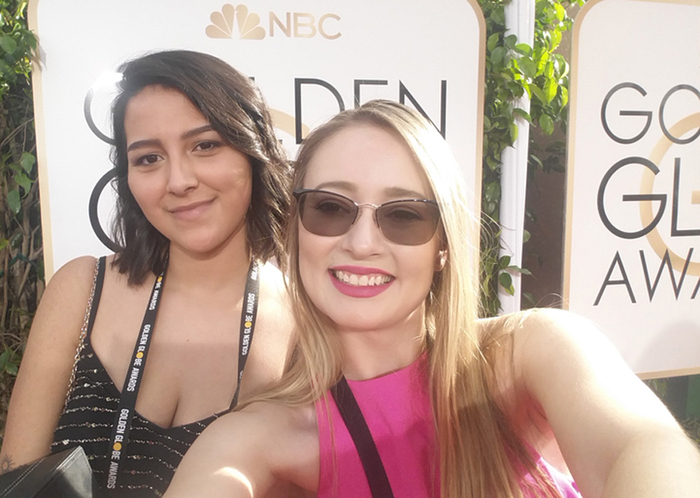 When more than 20 million people tuned in around the world to watch the 74th annual Golden Globes Awards on the first weekend of January, few of them knew the role two California State University, Northridge students played in making sure the broadcast was a success. Two weeks before celebrities hit the red carpet, the Hollywood Foreign Press Association (HFPA), a group of international journalists who produce the Golden Globes, made a specific request for CSUN cinema and television arts (CTVA) professor Nate Thomas. Thomas selected senior CTVA students Amanda Derzy and Amanda Nieto — who both stood out in his classroom — for the task. In January 2016, the HFPA awarded CSUN with $2 million to support students and enhance technology in the Department of Cinema and Television Arts. A portion of the gift went toward creating the HFPA scholars program in which students are mentored by CTVA faculty and industry professionals. Five days before the Golden Globes, Derzy and Nieto began scripting, shooting, and editing promotional videos that were sent out on multiple social media outlets – a process Derzy said was made easier because of what she learned at CSUN. The pair also crafted pre-made “congratulations” messages for more than 120 different nominees in 24 different categories to post on the Golden Globes’ official Twitter account, which has nearly one million followers. In addition to making sure all posts were free of spelling errors, the pair ensured each celebrity was properly tagged in every photo, a mistake previous non-CSUN student interns made last year. Nieto said the pair put in a lot of hard work in the days leading up to the show to ensure they were as prepared as possible. The reality of what she was working on — the Golden Globes, one of the entertainment industry’s most talked-about award shows — did hit Derzy until she arrived at the Beverly Hilton Hotel, where the Golden Globe Awards have been held since 1961. Shortly after the Golden Globe Awards ended, Thomas received phone calls from HFPA officials, applauding Derzy, Nieto and their work.